COLOREA is a child-orientated, completely non-violent computer programme for little artists. More than 100 different painting patterns can be imaginatively designed over and over again. Subjects in many different stylistic ways see to it that kids work creatively with colour, forms and the computer for hours. All the produced compositions of the little artists can be stored and printed. So you’ll have nice memories of your child’s early years. The painting of the pattern is child- orientated and easy. By using the coloured pencils or the colour bar you can choose the colours. Underneath the range of coloured pencils you find buttons for additional shadow and lightning effects. The colour of these effects can be determined by the previous choice with the help of the coloured pencils. 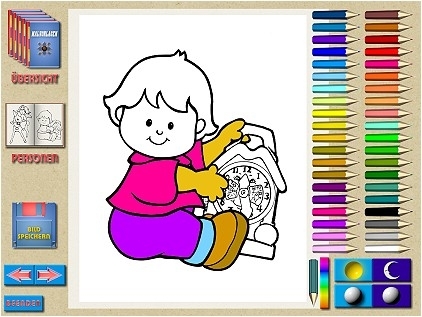 With the COLOREA - Picture Viewer you can add frames and speech bubbles to the pictures of the big computer colouring book, COLOREA. The pictures can be printed with the help of the print module.